Trycom manufacture a range of high quality industrial communication converters and digital Input / Output Modules. 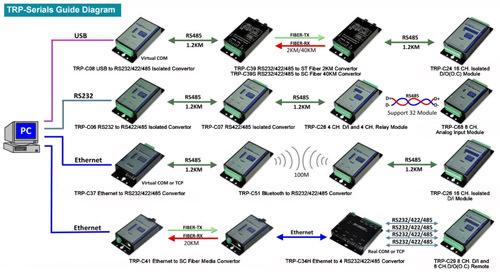 Their convertor product range supports RS232 to RS422/485, Ethernet to RS232 and Zigbee to RS232. These modules are ideally suited for many industrial automation and networking applications. The TRP-C06H allows 2 x RS232 line signals to be bi-directionally converted to RS-422 or RS-485 standard and transmit data up to 1.2km. The TRP-C24 is an isolated output open collector RS-485 module which supports ASCII and Modbus RTU, with 16 digital outputs channels. TRP-C26 - 16-CH isolated digital input RS-485 module: Supports ASCII and Modbus RTU. The TRP-C26 provides 16 optical isolated digital input channels. This allows the logic signal to be input from 0 to 30V DC. The TRP-C34 is a fast 4-port serial to Ethernet device designed to instantly convert data from RS-232/422/485 interfaces to a 10/100Mbps Ethernet network running at the TCP/IP protocol. The TRP-C39 fibre converter allows RS-232/422/485 signals to be bi-directionally converted to fibre optic and extends the distance up to 2km over multi-mode. Equinox distributors for Trycom Technology Co Ltd.